We all have them….the friends we adore and who are so important to us but who somehow get lost amongst all our other commitments. You know how it goes; a couple of weeks without seeing each other becomes a couple of months…..and then more time passes….and then more time….so that getting in touch begins to feel uncomfortable. Then, one day, you realise just how much you miss them and you arrange to meet up. It’s a little awkward at first; realising how much you’ve missed out on, feeling guilty for leaving it so long, feeling, perhaps, a little resentful of the missed months….but the awkwardness passes in minutes, you pick up where you left off as if no time had passed at all. You remember how much you love your friend and how good they make you feel simply by being in their company. …and that’s how it has been for me and my beloved kitchen garde n. At first I had an excuse not to visit because of the accident that damaged both hands but for the last five weeks one of my hands has been better…..and yet I still didn’t return to my oasis. I guess a part of me was worried about what I would find, worried that my unvisited patch would take revenge on me for neglecting it for so long by throwing up huge weeds and rotting winter veg….. I shouldn’t have worried. Yes, we had an awkward first few minutes….did my broad beans actually turn their leafy backs on me when I arrived? Were those pesky little weeds laughing at me? No matter. I sat amongst my broad beans, gently weeding between them and gradually I began to feel forgiven. The garden hasn’t fared too badly without me over the last three months but I think that’s because I put so much work and love into it last autumn. 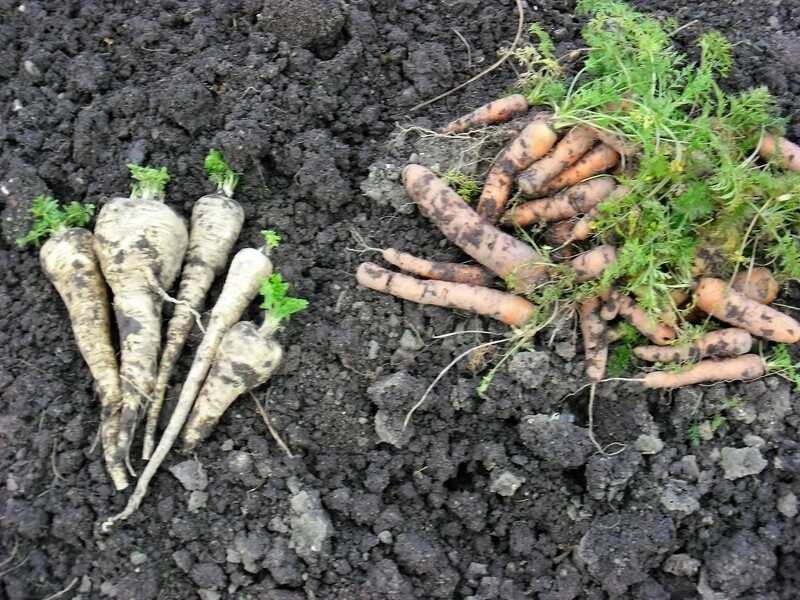 Yes, there is much to do as we race towards spring…..but my little patch of soil is still feeding me…….and, as if to say ‘thank you for coming back’, that soil yielded me the gift of parsnips and carrots as I was leaving. Gardens, like good friends, will forgive and always take you back….so if you have neglected yours this winter go and make a visit…..you may be surprised by the gifts your old friend gives you. So glad you have been able to get back. I can see you in your kitchen now chopping and smelling the veg as you turn it into a delicious veggie soup. I was very close to tears as I read this (silly of me, I know). It’s so heartwarming and beautifully written! Lovely Vivi… You are so Poetic. Just speaking from the heart. 🙂 Thank you.